What does one say about someone that knew two of the of countries most notable wit and wisdom characters of the late 1800’s and into the Twentieth Century? Well one would be best to ask Uncle Josh Weathersby of Punkin Center. Uncle Josh aka Cal Stewart was a grand gentleman of the early sound recordings put out by Thomas Edison and Mr Stewart portrayed him with folksy excellence. Born June 14, 1856, Mr. Stewart was the voice for Uncle Josh and his early on characterizations lent an enviable touch to demonstrating to the public of home-spun yarn and tale. As mentioned, Cal Stewart made the acquaintance and friendship of two American icons of mirth and story, Mark Twain and Will Rogers. He met this gentleman while travelling the country presenting his Uncle Josh persona in vaudeville and medicine shows. Due in large part to their similar love of comedy, these masters of their craft aided Cal Stewart in his growing popularity and appreciation. It was because of America’s love of the Punkin Center resident that Thomas Edison invited Stewart, in 1897, to make permanent a number of the Uncle Josh monologues on his newly invented recording device. People could instantly identify the voice of Stewart’s by the pronounced laughter that was unique to him. 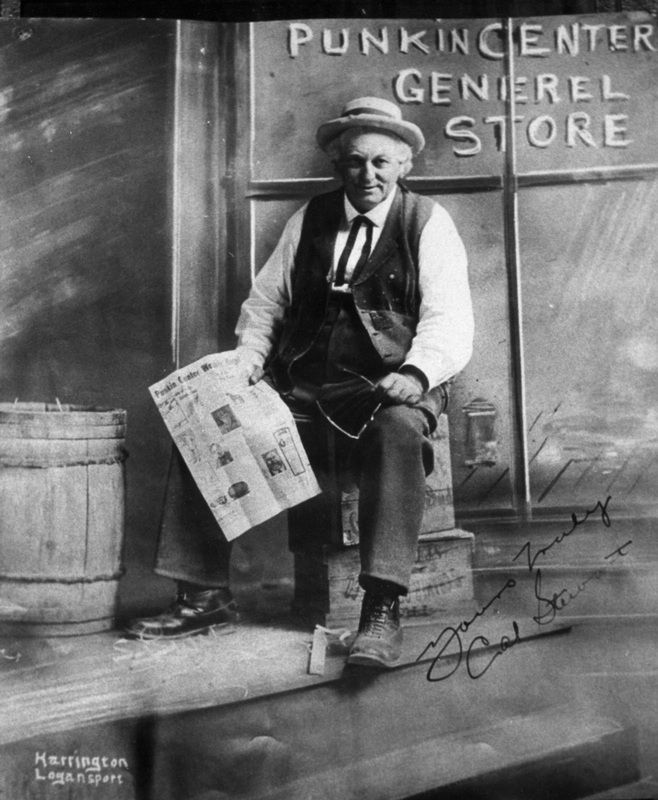 “Uncle Josh’s Arrival in New York” (1898) and “Uncle Josh’s Huskin’ Bee Dance” (1901) are just two of the many Uncle Josh recordings made by Cal Stewart. These recordings, along with other favorites made people laugh and cry as they listened to the Will Rogers of PunKin Center commiserate about slow country life. His style of ‘yokum’ endeared him to many of his radio audience. Sadly, America lost this gentleman’s storytelling in 1919 but his recordings continued to resonate for a long time after and can still be found today.